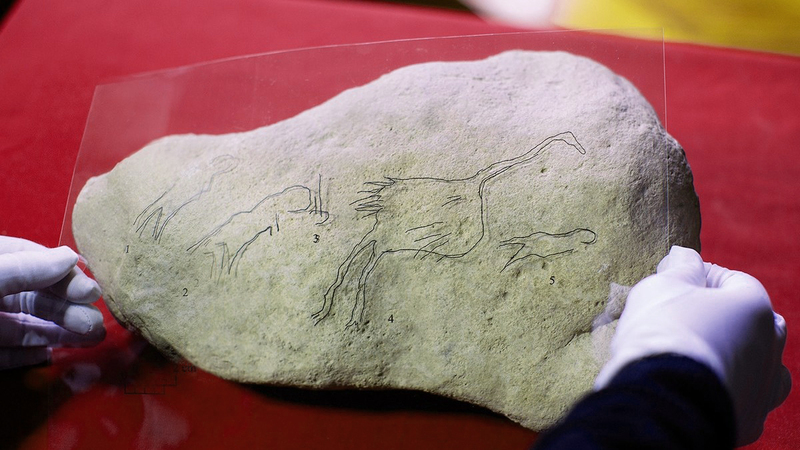 An article by George Dvorsky on gizmodo.com - Rare Portable Paleolithic Art Depicts a Mysterious Scene Involving Birds and Humans - reports on the discovery and analysis in Europe of a rare artefact of portable rock art. Dating back more than 12,000 years, this rare example of prehistoric rock art features a scene involving birds and humans. The artefact, from the Late Upper Paleolithic, is attracting attention because of its portable nature, the fauna represented - avian rather than the more usual fauna - and a scene depicted rather than individual figures. Details of the discovery were published recently in the science journal L'Anthropologie (details below). The 30-centimeter-wide limestone artefact was discovered in 2011 at the Hort de la Bequera archaeological site in Spain. Despite 14 years of continuous excavations, this relic was the only art piece of its kind to be discovered at the site. The artist would have used a flint tool to etch the clean and clear lines into the limestone. There are five distinct motifs, with (from left to right) possibly two human figures, one large bird, an indeterminate figure, and possibly an avian chick. 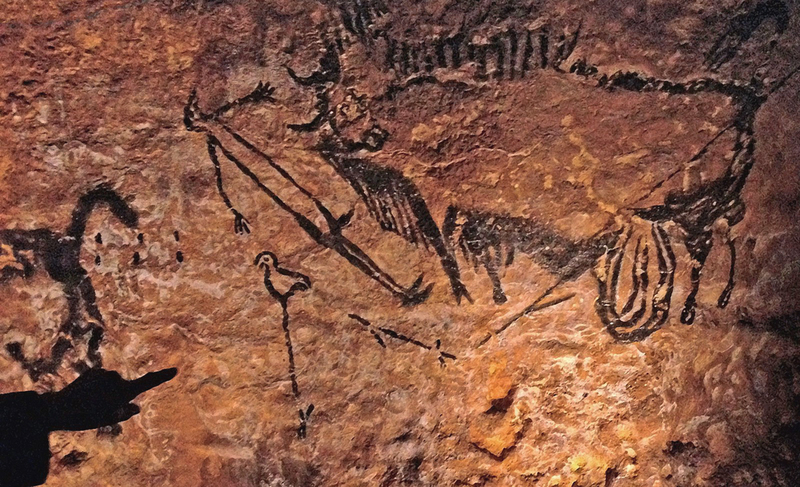 The authors of the new study, led by Inés Domingo from the University of Barcelona, are analysing the five distinct motifs by visual inspections of the piece, and by comparing the art to previously known representations in European Palaeolithic art. The large bird is likely a crane, due to biological similarities with the species and other artworks. As to the meaning or significance of the scene, the researchers can only speculate, but they think it may have something to do with both hunting and motherhood. The bird motif may have had both an economic and symbolic role. This paper reports the discovery of a new example of portable art in North-eastern Iberia dating to the Late Upper Palaeolithic (12.250 ± 60 BP). The piece is analysed in relation to the European Palaeolithic art assemblage to determine its significance and how it contributes to our understandings of Palaeolithic artistic practices. Both the motifs depicted (birds and humans) and the patterns of composition (a narrative scene) are unusual in Palaeolithic assemblages. In addition, this new find contributes to filling a geographic gap in the artistic record as evidence of Palaeolithic art is rare in Catalonia. The anatomical features of one of the birds suggest that it is a crane, a species that has been depicted in a limited number of sites, as summarized in this paper. Moreover, there are only three known example of birds and humans interacting in a narrative scene in Palaeolithic art. Exhibiting innovations in media, subject matter and compositional norms, this new find has the potential to change the classic definition of European Upper Palaeolithic art and integrate the region in the artistic trends circulating along Mediterranean Iberia during the Upper Magdalenian. This brings to mind another mysterious prehistoric rock art depiction involving a bird and a human - 'The Scene of the Dead Man' in Lascaux (shown above).